sardines are a rich source of omega-3 fatty acids and is a popular fish in the south especially Tamil Nadu and Kerala and.many do not try buying this as it is very bony and difficult to eat...but if u are true to your heart just try this!!! heat oil and fry dhaniya,fenugreek,jeera,pepper,and coconut till spice flavour is out and grind to paste adding little water. in the same kadai, pour some more oil, season with mustard, curry leaves and green chillies and add the shallots and fry. now add the ginger garlic paste,and the tomatoes and fry for few minutes till the tomatoes become pulpy. add the red chillie powder and turmeric and also the tamarind pulp and salt and let it cook till the raw smell of all the masalas are gone and the oil seperates..
add the ground masala now 2 cups of water enough for the gravy and allow to boil well.when the gravy has cooked sufficiently with all the tastes add the sardines one by one. cook exactly for 10 minutes and turn off. do not stir with laddle at this stage just tilt the kadai holding at both ends to mix the fish and masala as it may break the fish. gently transfer to a dish and serve hot with rice. Thank u Sneha!. Your Mathi Meen Kuzhambu does the same here. 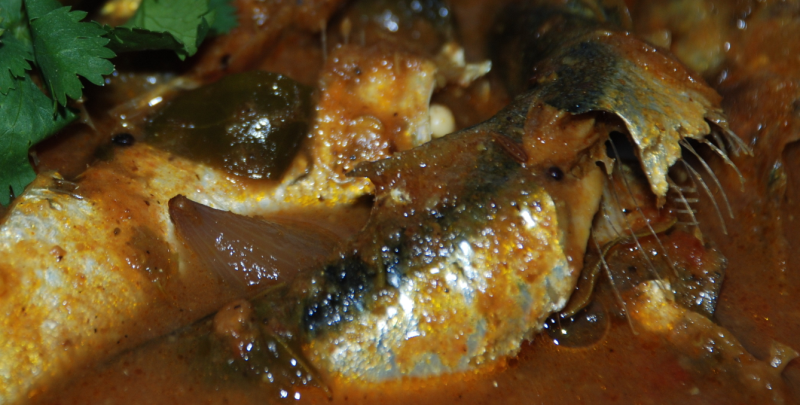 adding fenugreek to the fish gravies adds a lot of taste to the curry making it very southern.